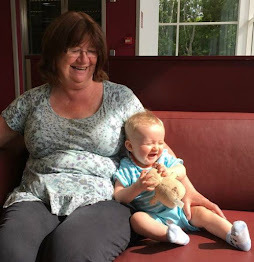 I've been looking for farm animals suitable for Bear to play with as he is now very good at doing grunting noises like pigs make and loves hearing the noises of the other animals. 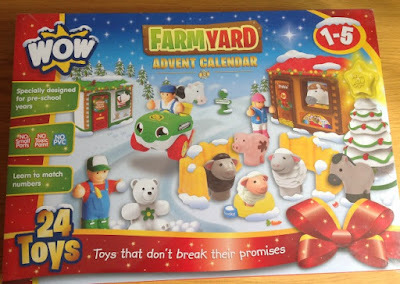 They all seem to be for 3+ years so when I first saw the WOW toys advent Farm Yard calendar I knew it was exactly what I was looking for. 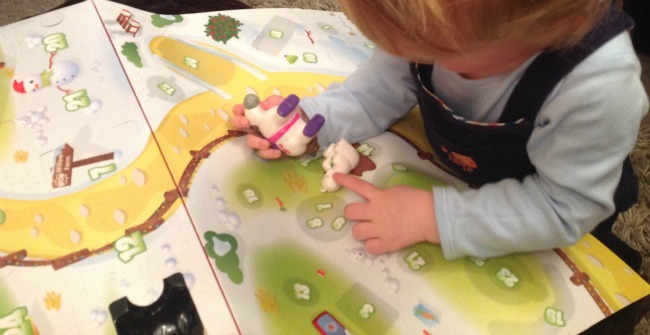 It's suitable for ages 1 - 5 and as I had previously reviewed one of their pocket money toys, the Christmas play time friends, I knew the quality of the toys would be good. You can read my review here. They are described as being free from all nasties. No PVC, phthalates, toxic paint, cadmium, batteries or small parts and so are safe to be chewed, nibbled, hugged and loved! I knew Bear would definitely give them the taste test. I did hesitate because of the price, at £25 I thought it was a bit expensive (although it works out at only just over £1 for each toy). I didn't want to buy one and it not be suitable for Bear so I waited and was lucky to grab one at half price on a daily deals at Amazon. It was decided that because Bear is so little and doesn't understand time he could open them all on one day. 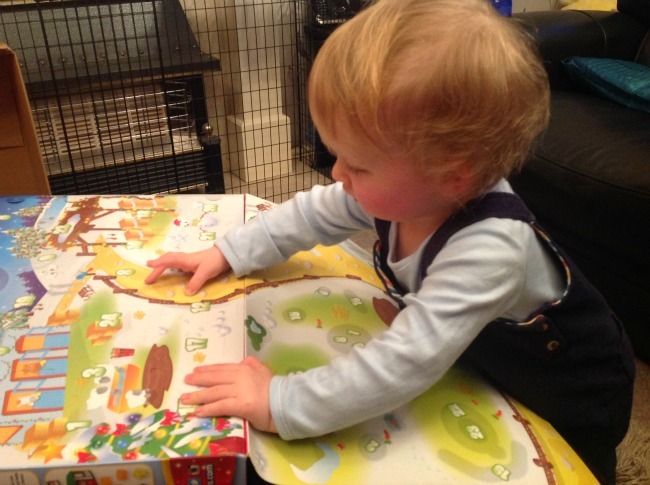 Bear has books with lift up flaps so he understands that if you lift a flap there is something underneath. He couldn't wait to get started. 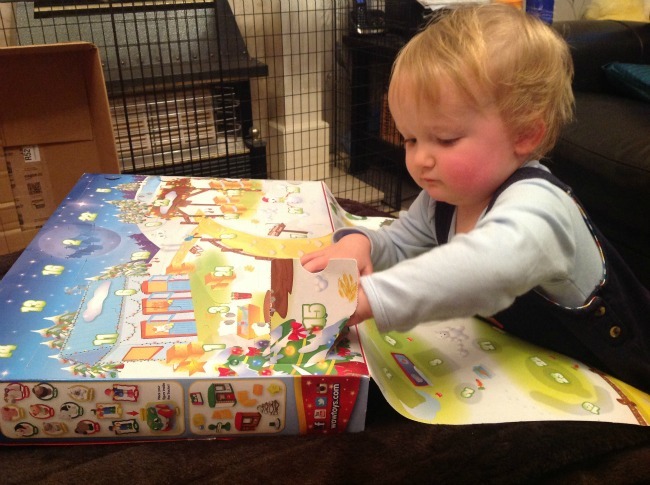 Mummy and daddy came to see him open his first advent calendar. There were a lot of awwws and ooohs! He loved it. From the first toy, a horse he wouldn't let go of, all through to the last toy, a pig, which brought the obligatory grunting noises! Bear thought he would start with window number 15. He wasn't disappointed! Bear loved the horse and wouldn't put it down so getting the second toy was a bit tricky. Bear wouldn't change a thing he loved it all and just to see his little face everytime he found another toy was worth every penny of the £12.49 I paid. I liked that each toy was named although Bear is too young to appreciate it. All the animals and people have the same sized base so they all fit into the tractor or the horse. I don't understand why one of the toys is a teddy bear, Bear seemed to like it though! Maybe it was put in there just for us. 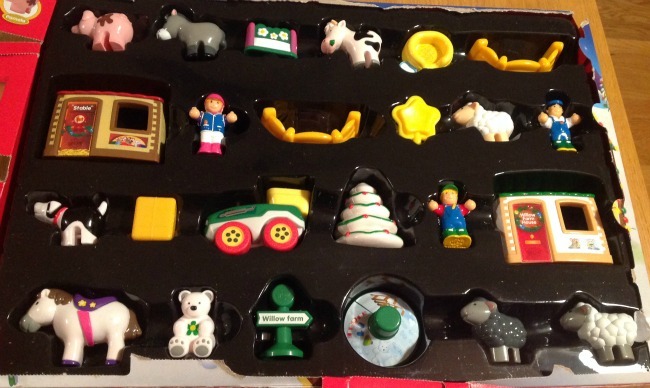 The top layer that has the numbered windows isn't stuck down anywhere so it is possible to see the next toy just by lifting it slightly, which Bear did lots. The only other negative was the Christmas tree. It comes in 3 parts the base on day 7, the tree on day 8 and a star to top it on day 9. If Bear was only opening one window a day he would have been bemused and disappointed on day 7. He did love putting them together and taking them apart though. Animals, people, a tractor and a teddy bear! 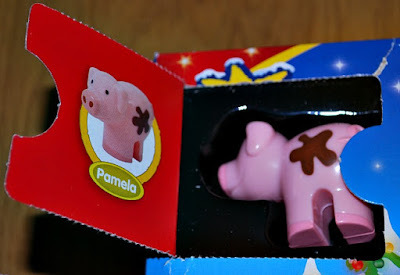 I would definitely buy another of these because they are really well made and fun, a great alternative to chocolate. 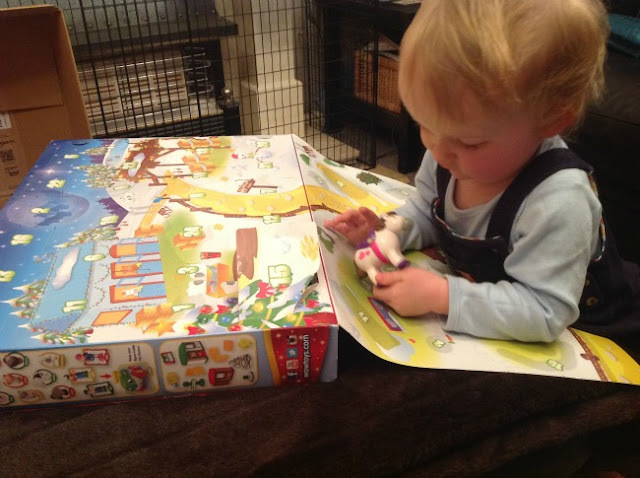 If Bear was older I would also have a couple of standby items for the days when the toys are boring, for example the tree base but saying that all the parts are displayed clearly on the side of the box. 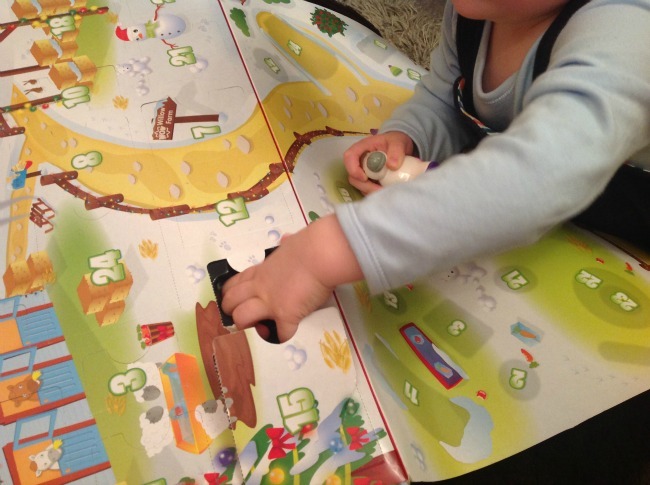 Bear loved it and now wants the Wonderland and Town advent calendar! Who told him about them? Do you buy toy advent calendars? Which is your favourite?